Tickets are on Amex presale now. Public on sale begins Friday, June 12 at noon. UPDATE: A second show was added on September 26, 2009 (Buy Tickets). Both of these bands have been enjoying pretty good runs lately. After making a huge impact with American audiences on SNL back in April, Phoenix finally released their album Wolfgang Amadeus Phoenix on May 26, and to no one’s surprise, they’re playing two highly sold out shows this month at MHOW and Terminal 5 (June 18-19). 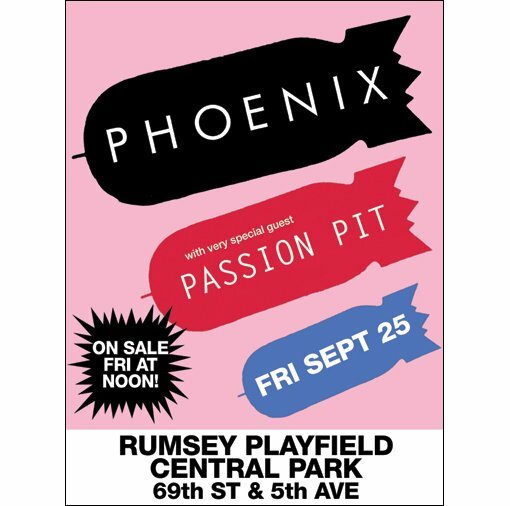 Not long after their universally buzzed about residency at Pianos and the release of their terminally catchy Chunk of Change EP, openers Passion Pit were quickly snapped up by Columbia records in the UK and Frenchkiss in the US. Their well received debut LP Manners came out in May and they’ll actually be playing opposite Phoenix for the first of their two night sold out run at the Bowery Ballroom on June 19. More Phoenix and Passion Pit tour dates after the jump.